The basic form of most mandalas is a square with four gates containing a circle with a center point. Each gate is in the general shape of a T. Mandalas often have radial balance. 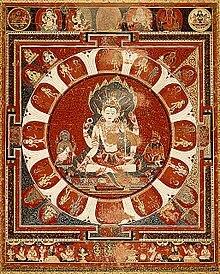 The term appears in the Rigveda as the name of the sections of the work, and Vedic rituals use mandalas such as the Navagraha mandala to this day. Mandalas are also used in Buddhism. 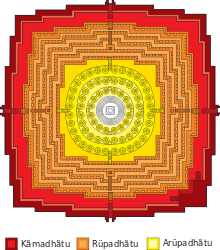 A yantra is similar to a mandala, usually smaller and using a more limited colour palette. It may be a two- or three-dimensional geometric composition used in sadhanas, puja or meditative rituals, and may incorporate a mantra into its design. It is considered to represent the abode of the deity. Each yantra is unique and calls the deity into the presence of the practitioner through the elaborate symbolic geometric designs. 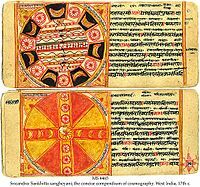 According to one scholar, "Yantras function as revelatory symbols of cosmic truths and as instructional charts of the spiritual aspect of human experience"
Despite its cosmic meanings a yantra is a reality lived. Because of the relationship that exists in the Tantras between the outer world (the macrocosm) and man's inner world (the microcosm), every symbol in a yantra is ambivalently resonant in inner–outer synthesis, and is associated with the subtle body and aspects of human consciousness. 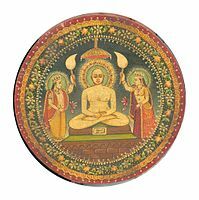 The Rajamandala (or Raja-mandala; circle of states) was formulated by the Indian author Kautilya in his work on politics, the Arthashastra (written between 4th century BCE and 2nd century BCE). It describes circles of friendly and enemy states surrounding the king's state. 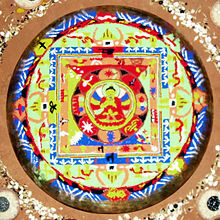 In Vajrayana Buddhism, mandalas have been developed also into sandpainting. They are also a key part of Anuttarayoga Tantra meditation practices. 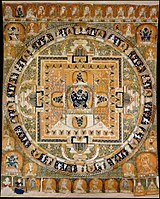 An example of this type of mandala is Vajrabhairava mandala a silk tapestry woven with gilded paper depicting lavish elements like crowns and jewelry, which gives a three-dimensional effect to the piece. A mandala can also represent the entire universe, which is traditionally depicted with Mount Meru as the axis mundi in the center, surrounded by the continents. 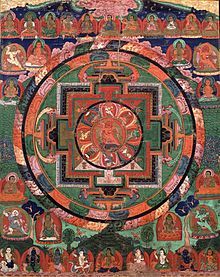 One example is the Cosmological Mandala with Mount Meru, a silk tapestry from the Yuan dynasty that serves as a diagram of the Tibetan cosmology, which was given to China from Nepal and Tibet. In the mandala, the outer circle of fire usually symbolises wisdom. The ring of eight charnel grounds represents the Buddhist exhortation to be always mindful of death, and the impermanence with which samsara is suffused: "such locations were utilized in order to confront and to realize the transient nature of life". Described elsewhere: "within a flaming rainbow nimbus and encircled by a black ring of dorjes, the major outer ring depicts the eight great charnel grounds, to emphasize the dangerous nature of human life". Inside these rings lie the walls of the mandala palace itself, specifically a place populated by deities and Buddhas. The mandala is "a support for the meditating person", something to be repeatedly contemplated to the point of saturation, such that the image of the mandala becomes fully internalised in even the minutest detail and can then be summoned and contemplated at will as a clear and vivid visualized image. With every mandala comes what Tucci calls "its associated liturgy ... contained in texts known as tantras", instructing practitioners on how the mandala should be drawn, built and visualised, and indicating the mantras to be recited during its ritual use. By visualizing "pure lands", one learns to understand experience itself as pure, and as the abode of enlightenment. The protection that we need, in this view, is from our own minds, as much as from external sources of confusion. 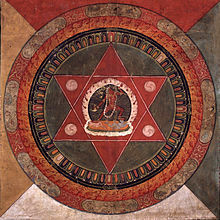 In many tantric mandalas, this aspect of separation and protection from the outer samsaric world is depicted by "the four outer circles: the purifying fire of wisdom, the vajra circle, the circle with the eight tombs, the lotus circle". The ring of vajras forms a connected fence-like arrangement running around the perimeter of the outer mandala circle. Whereas the above mandala represents the pure surroundings of a Buddha, this mandala represents the universe. This type of mandala is used for the mandala-offerings, during which one symbolically offers the universe to the Buddhas or to one's teacher. Within Vajrayana practice, 1,000,000 of these mandala offerings (to create merit) can be part of the preliminary practices before a student even begins actual tantric practices. This mandala is generally structured according to the model of the universe as taught in a Buddhist classic text the Abhidharma-kośa, with Mount Meru at the centre, surrounded by the continents, oceans and mountains, etc. One Japanese branch of Mahayana Buddhism—Shingon Buddhism—makes frequent use of mandalas in its rituals as well, though the actual mandalas differ. When Shingon's founder, Kukai, returned from his training in China, he brought back two mandalas that became central to Shingon ritual: the Mandala of the Womb Realm and the Mandala of the Diamond Realm. Mandalas have sometimes been used in Pure Land Buddhism to graphically represent Pure Lands, based on descriptions found in the Larger Sutra and the Contemplation Sutra. The most famous mandala in Japan is the Taima mandala, dated to about 763 CE. 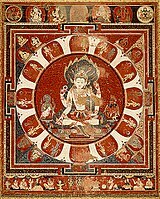 The Taima mandala is based on the Contemplation Sutra, but other similar mandalas have been made subsequently. Unlike mandalas used in Vajrayana Buddhism, it is not used as an object of meditation or for esoteric ritual. Instead, it provides a visual representation of the Pure Land texts, and is used as a teaching aid. Mayan Tzolk'in wheel from 498 AD. One of several parallels between Eastern and Mesoamerican cultures, the Mayan civilization tended to present calendars in a mandala form. 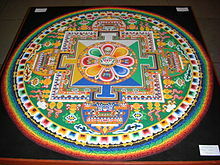 It is similar in form and function to the Kalachakra (Wheel of Time) sand paintings of Tibetan Buddhists. The tzolk'in wheel has 260 segments, surprising because the Mayans recognized that the calendar year is 365 days long. The inclusion of the specific number 260 could however relate to the 26,000 year cycle of the precession of the equinoxes. If so, this would indicate a remarkable awareness of these great cycles of time by this culture. Ultimately, the symbol was probably used for ritual purposes, and to measure the interval of a number of 9-month intervals like pregnancy, the cultivation time of some crops, and rituals that were performed at a 260-day spacing each year, for example, spring and fall. This Mayan symbology has even made its way into New Age symbolism as the Dreamspell calendar, developed by José Argüelles. Sometimes described as an authentic Mayan mandala, it is "inspired by" elements of the Tzolk'in wheel of time. The Aztec Sun Stone as an amate print. The Sun Stone of the Aztec civilization was once believed to be their equivalent of a Tzolk'in calendar, but is now thought to be a ceremonial representation of the entire universe as seen by the Aztec religious class. The earliest interpretations of the stone relate to its use as a calendar. In 1792, two years after the stone's unearthing, Mexican anthropologist Antonio de León y Gama wrote a treatise on the Aztec calendar using the stone as its basis. Some of the circles of glyphs are the glyphs for the days of the month. The four symbols included in the Ollin glyph represent the four past suns that the Mexica believed the earth had passed through. Another aspect of the stone is its religious significance. One theory is that the face at the center of the stone represents Tonatiuh, the Aztec deity of the sun. It is for this reason that the stone became known as the "Sun Stone." Richard Townsend proposed a different theory, claiming that the figure at the center of the stone represents Tlaltecuhtli, the Mexica earth deity who features in Mexica creation myths. Modern archaeologists, such as those at the National Anthropology Museum in Mexico City, believe it is more likely to have been used primarily as a ceremonial basin or ritual altar for gladiatorial sacrifices than as an astrological or astronomical reference. Yet another characteristic of the stone is its possible geographic significance. The four points may relate to the four corners of the earth or the cardinal points. The inner circles may express space as well as time. Lastly, there is the political aspect of the stone. It may have been intended to show Tenochtitlan as the center of the world and therefore, as the center of authority. Townsend argues for this idea, claiming that the small glyphs of additional dates amongst the four previous suns—1 Flint (Tecpatl), 1 Rain (Atl), and 7 Monkey (Ozomahtli)—represent matters of historical importance to the Mexica state. He posits, for example, that 7 Monkey represents the significant day for the cult of a community within Tenochtitlan. His claim is further supported by the presence of Mexica ruler Moctezuma II's name on the work. These elements ground the Stone's iconography in history rather than myth and the legitimacy of the state in the cosmos. The Cosmati pavements, including that at Westminster Abbey, are geometric mandala-like mosaic designs from thirteenth century Italy. The Great Pavement at Westminster Abbey is believed to embody divine and cosmic geometries as the seat of enthronement of the monarchs of England. 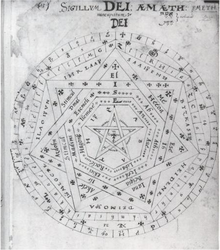 Alchemist, Mathematician and Astrologer John Dee developed a geometric symbol which he called the Sigillum Dei 'Seal of God' manifesting a universal geometric order which incorporated the names of the archangels, derived from earlier forms of the clavicula salomonis or key of Solomon. The Layer Monument, an early 17th-century marble mural funerary monument at the Church of Saint John the Baptist, Maddermarket, Norwich, is a rare example of Christian iconography absorbing alchemical symbolism to create a mandala in Western funerary art. In Persian Islamic theosophy, each of us is a part of God. We have been separated from our source like the rays of the sun and, we need to always keep in our mind that we have a divine light in us, which is the source of love. This light always shows us the right path to grow and find our way back to our source. Therefore, in Persian Shamseh motif which symbolizes the sun, there is a center which is the symbol of god or the source of energy. This small circle is surrounded by many other circles or polygons with the same center but in different sizes. These circles are the light rays of the sun which symbolize every god's creature. Every creature tends to reach God, so the purpose of life is to reach back the source of energy which is mentioned as pure love in some references. Some of us are closer to our origin, while some of us have a long journey to reach it. As in Shamseh, some circles are smaller, therefore, closer to the center. Shamseh motif was wildly applied during Safavid time in Iran. Safavid was one of the most important ruling dynasties of Iran in art, architecture, astrology, philosophy, and theosophy. An extraordinary example of Shamseh motif would be the tiling of the ceiling of Sheik Lotfollah mosque in Isfahan. Persian "Shamseh" motif painted on a copper plate. The art of hand painting and enameling is called "Meenakari" in Farsi. —  Carl Jung, Memories, Dreams, Reflections, pp. 195–196. One of the most intense archaeological discoveries in recent years that could redefine the history of eastern thought and tradition of mandala is the discovery of five giant mandalas in the valley of Manipur made with Google Earth imagery. Located in the paddy field in the west of Imphal, the capital of Manipur, the Maklang geoglyph is perhaps the world's largest mandala built entirely of mud. The site wasn’t discovered until 2013 as its whole structure could only be visible via Google Earth satellite imagery. The whole paddy field, locally known as Bihu Loukon, is now protected and announced as historical monument and site by the government of Manipur in the same year. The site is situated 12 km aerial distance from Kangla with the GPS coordinates of 24° 48' N and 93° 49' E. It covers a total area of around 224,161.45 square meters. This square mandala has four similar protruding rectangular ‘gates’ in the cardinal directions guarded each by similar but smaller rectangular ‘gates’ on the left and right. Within the square there is an eight petalled flower or rayed-star, recently called as Maklang ‘Star fort’ by the locals, in the centre covering a total area of around 50,836.66 square meters. The discovery of other five giant mandalas in the valley of Manipur is also made with Google Earth. The five giant mandalas, viz., Sekmai mandala, Heikakmapal mandala, Phurju twin mandalas and Sangolmang mandala are located on the western bank of the Iril River. Buddhist architecture often applied mandala as the blueprint or plan to design Buddhist structures, including temple complex and stupas. A notable example of mandala in architecture is the 9th century Borobudur in Central Java, Indonesia. It is built as a large stupa surrounded by smaller ones arranged on terraces formed as a stepped pyramid, and when viewed from above, takes the form of a giant tantric Buddhist mandala, simultaneously representing the Buddhist cosmology and the nature of mind. Other temples from the same period that also have mandala plans include Sewu, Plaosan and Prambanan. The similar mandala plan design are also observable in Cambodia, Thailand and Myanmar. Phylogenetic tree of Hexapoda (insects and their six-legged relatives). Such trees have been called phylogenetic mandalas. Circular diagrams are often used in phylogenetics, especially for the graphical representation of phylogenetic relationships. Evolutionary trees often encompass numerous species that are conveniently shown on a circular tree, with images of the species shown on the periphery of a tree. Such diagrams have been called phylogenetic mandalas. Mandalas can be found in early Buddhist art from the 14th and 15th centuries. 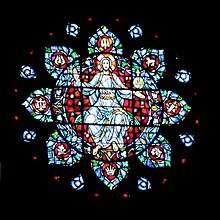 ^ "mandala". Merriam–Webster Online Dictionary. 2008. Retrieved 2008-11-19. ^ www.sbctc.edu (adapted). "Module 4: The Artistic Principles" (PDF). Saylor.org. Retrieved 2 April 2012. ^ Khanna Madhu, Yantra: The Tantric Symbol of Cosmic Unity. Thames and Hudson, 1979, p. 12. ^ Singh, Prof. Mahendra Prasad (2011). Indian Political Thought: Themes and Thinkers. Pearson Education India. ISBN 8131758516. pp. 11-13. ^ Dellios, Rosita (2003-01-01). "Mandala: from sacred origins to sovereign affairs in traditional Southeast Asia". Bond University Australia. Retrieved 2011-12-11. ^ "Vajrabhairava Mandala". The Metropolitan Museum of Art. The Metropolitan Museum of Art. Retrieved 19 November 2017. ^ Watt, James C.Y. (1997). When Silk was Gold: Central Asian and Chinese Textiles. New York: The Metropolitan Museum of Art. p. 95. ^ "Cosmological Mandala with Mount Meru". The Metropolitan Museum of Art. The Metropolitan Museum of Art. Retrieved 19 November 2017. ^ Watt, James C.Y. (2010). The World of Khubilai Khan: Chinese Art in the Yuan Dynasty. New York: Yale University Press. p. 247. Retrieved 19 November 2017. ^ Camphausen, Rufus C. "Charnel- and Cremation Grounds". Retrieved 10 October 2016. ^ a b "Mandala". Retrieved 10 October 2016. ^ "The Mandala in Tibet". Retrieved 10 October 2016. ^ "Mandala". Retrieved 10 October 2016. ^ Kvaerne, Per (1975). "On the Concept of Sahaja in Indian Buddhist Tantric Literature. (NB: article first published in Temenos XI (1975): pp.88-135). Cited in: Williams, Jane (2005). Buddhism: Critical Concepts in Religious Studies, Volume 6. Routledge. ISBN 0-415-33226-5, ISBN 978-0-415-33226-2". Retrieved April 16, 2010. ^ "What Is a Mandala?". studybuddhism.com. ^ "Preliminary practice (ngöndro) overview". Retrieved 10 October 2016. ^ Townsend, Casey (1979). State and Cosmos in the Art of Tenochtitlan. Washington, DC: Dumbarton Oaks. ^ Townsend, Richard Fraser (1997-01-01). State and cosmos in the art of Tenochtitlan. Dumbarton Oaks, Trustees for Harvard University. ISBN 9780884020837. OCLC 912811300. ^ "Cosmati Pavement - Video Library". www.westminster-abbey.org. ^ Wangam, Somorjit (2018). World's Largest Mandalas from Manipur and Carl Jung's Archetype of the Self, p. 25-33. NeScholar, ed. Dr. R.K.Nimai Singh ,Imphal. ISSN 2350-0336. ^ A. Wayman (1981). "Reflections on the Theory of Barabudur as a Mandala". Barabudur History and Significance of a Buddhist Monument. Berkeley: Asian Humanities Press. ^ a b Hasegawa, Masami (2017). "Phylogeny mandalas for illustrating the Tree of Life". Molecular Phylogenetics and Evolution. 117: 168–178. doi:10.1016/j.ympev.2016.11.001. PMID 27816710. ^ "China Art Museum in Shanghai - Forms of Devotion". Retrieved 10 October 2016. ^ "Haljinu "Mandala of Desires" dnevno posjećuje čak 30 000 ljudi!". Tucci, Giuseppe (1973). The Theory and Practice of the Mandala trans. Alan Houghton Brodrick, New York, Samuel Weisner. Wikimedia Commons has media related to Mandalas.